Price includes all transport including Adelaide connection, dorm accommodation for 1 night, morning tea and biscuits day 1, lunch on day 1 and breakfast on day 2. You will need to pay for not indicated meals. The dorm accommodation is pre-arranged for all our customers. Bring along warm clothes, water bottle, sunscreen, towel & toiletries, camera and of course a BIG SMILE!!! This tour departs on Monday, Thursday and Saturday, with seasonal departures also available on Tuesdays (between November and March). After being picked up at your CBD accommodation at around 7 am, you'll leave Melbourne on day one of your tour and head out to one of the coast's most famous surf beaches. While here, you can admire the dexterity of the surfers and the sweeping views while enjoying a delicious morning tea. 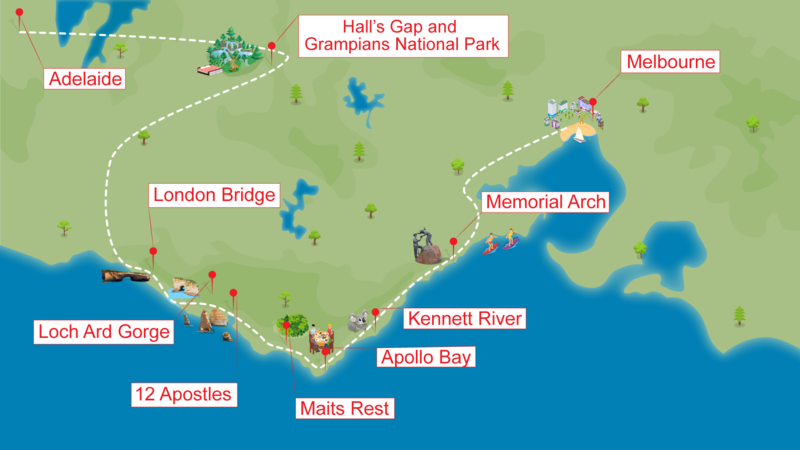 Then, you'll stop at the Great Ocean Road's famed historical Memorial Arch to admire this marvelous dedication and to take pictures. After spending some time walking along a peaceful beach, you'll drop into Lorne and Anglesea to admire the beautiful coastal vistas from the areas shorelines and lookouts. Next, you'll get to spot some of Australia's most beloved wildlife with a visit to Kennett River, where wild Koalas, Kookaburras, King parrots and Crimson Rosellas are in abundance. At Apollo Bay, indulge in a fresh sandwich lunch before journeying to Otway's Rainforest for a guided bushwalk along a gentle 800-metre track. This ancient temperate rainforest will amaze you as you take in the sights, dwarfed by some of the tallest trees in the world! Following your peaceful rainforest walk, you'll visit the phenomenal limestone structures of the Twelve Apostles. Loch Ard Gorge is your next stop and you'll be very glad you brought your camera by this point! Named after one of Australia's most famous shipwrecks, this gorge is stunning no matter what angle you view it from, whether it's from Razorback, Salt and Pepper or from the pristine beach below. Afterwards, we either visit the collapsed London Bridge or the Gibsons Steps. Some night-time kangaroo spotting at Halls Gap will give you the ultimate Aussie experience before you settle down for the night in the heart of the Grampians at Ned's Other Beds. Awakening to birdsong and glorious sunshine, you'll set off on a tour of the stunning Grampians National Park, where you'll be able to see birds, kangaroos, wallabies, koalas, emus and even echidnas in their natural habitats. Traversing through gorgeous eucalypt forest surroundings past waterfalls and impressive sandstone ridges, you'll visit Boroka and Reid's Lookout or Lake Bellfield to take in the majestic surrounds. You'll also see the largest waterfall in the Grampians, McKenzie Falls. Then, its over to the ominous sounding "Jaws of Death" sandstone balconies, as well as to Hollow Mountain or Chautauqua Peak to experience the never-ending scenery. After your busy day, you'll connect with your coach in Horsham for your final leg to Adelaide, being dropped off at Franklin St, Main Bus Station at around 7 pm. If preferred, you can opt for an upgrade to a double or twin accommodation. Simply let us know of your preference and we will contact you to finalize payment. Upgrades are subject to availability and prices may change for rooms at any time.